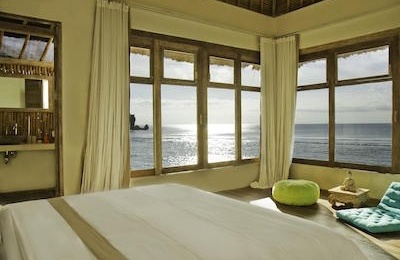 Rote Beach Surf Villa - Bo'a, Nembrala Guests overall rating: ☆☆☆☆☆ 0 based on 0 reviews. Main advantage of our beachside is that you always have a place to swim, even at the lowest tide of the month which is rare on this coast. With only three rooms we try to keep the experience exclusive and personal. We are like an extended family trying our best in order to reach our main goal: Make you feel at home. We are oriented to couples, groups or families looking for a hideway off the track.We are open from March until November. We can accomodate a total of 8 people. Our guests can enjoy romantic walks to deserted beaches just around the corner, and swim at beautiful tide pools. Surfing Bo’a wave, fishing, snorkel, sailing trips and kayak around the mangroves are a must do activity to see Rote at its best. Pilates lessons are available on site. 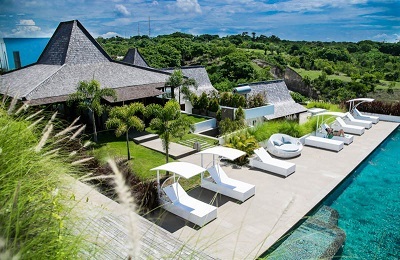 Rote Beach Surf Villa was built with a high respect for nature and the local environment. We are very proud to be 100% solar powered. Hydro-gardens were installed in order to be able to re-use water and all houses are built and furnished only from local material, with the help of local craftsmen. The Beach House is set on top of Bo’a Beach, it consists of two bedrooms with King size beds, each with their own bathroom and cozy terraces overlooking the ocean. Bedside views offer you a perfect view to the Bo’a surf break. The Beach House is rented as a whole, which is perfect for families or a group of friends. The main living room is open air cooled by the fresh sea breeze, adjacent to the dining area with panoramic views to the ocean and Bo’a’s wave. Here you will be able to enjoy meals prepared by our staff to your taste or simply kick back and relax while taking in the unique vibe of the beautiful Indian Ocean. In order to access Bo’a Beach or the cove you just have to open the beach gate. We have a yoga / pilates pavillion that can be used by the both houses of the property. Mezzanine Room: It has a king size on the top floor and a queen bed on the ground floor. Attic Room: kingsize bed with cozy terrace to stragaze at night and own toilet. At Rote Beach Surf Villa we aim to provide our guests a fresh, balanced and healthy menu. We try to source as many of our products organically and local as possible. For lunch and dinner our guests can expect a varied choice of international and traditional Indonesian meals, with a big mediterranean influence in style of cooking and use of ingredients. As we are in a remote area and we want to ensure maximum comfort of our guests, we will take care of their meals and money will be collected on arrival. The price per person per night for the food is 70 USD a day. We offer complementary soft drinks, snacks and fruits on their minibar. The tree house is a one bedroom bungalow on stills, positioned right on top of the cove. It is open to the elements with a king size bed and a veranda upstairs, an outdoor bathroom with a living room and deck space downstairs, all overlooking the ocean. The Tree House gives you the feeling of being right on top of the ocean, where you will enjoy the freshness of the passing breeze and completely relax listening to the steady sound of the sea. In order to access Bo’a Beach or the cove you just have to open the beach gate, we are just on top of the beach. We have a yoga / pilates pavillion that can be used by the both houses. 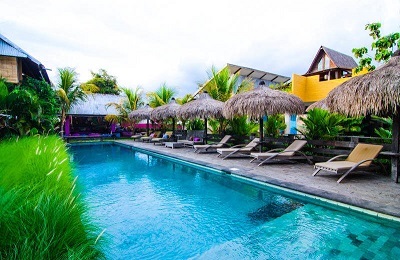 At Rote Beach Surf Villa we aim to provide our guests a fresh, balanced and healthy menu. We try to source as many of our products organically and local as possible. For lunch and dinner our guests can expect a varied choice of international and traditional Indonesian meals, with a big mediterranean influence in style of cooking and use of ingredients. As we are in a remote area and we want to ensure maximum comfort of our guests, we will take care of their meals and money will be collected on arrival. The price per person per night for the food is 50 USD a day. We offer complementary soft drinks, snacks and fruits on their minibar. Surf the world class wave of Bo’a right in front of Rote Beach Surf Villa, a gem still to be discovered by most. Therefore you will usually have an average of only 6 surfers to share the wave with throughout the whole year. A wave of many moods, Bo’a can deliver long powerful barreling waves one day and the next day fun long rippable walls. A high performance wave suitable for intermediate to advanced surfers. The water in Bo’a is never cold, you can surf with a lycra all year around. July, August and September are the chilliest months, if you suffer from cold easily, you can bring a 1 to 2 mm lycra. Start the day with an early surf or pilates session, have breakfast at 6:30 onwards. Enjoy coconut water, fruits, granola, pancakes and eggs to start the day with energy. You can either discover the island by your own or we can organize you different sightseeing excursions. Lunch is served from 12:30 to 13:00 pm. In the afternoon guests usually relax, read a book or have a siesta. You can either surf, walk on Bo’a beach to other deserted beaches on the surrounding. Have a drink while seeing the amazing sunsets or pamper yourself with a massage. Pilates: Give yourself a treat by starting your day with a pilates session. Addressed to both, your mind and body, pilates helps you to reeducate your posture, movement and alignment. Within just a few pilates sessions you will be able to reduce tensions and bad habits that interfere the body mechanisms. Massage: Pamper yourself with the healing hands of our spa therapist. Our aim is to give you the treatment that you require and to make you feel rejuvenated. Surf & Kitesurf: there is instructors on the island, but you need to bring your own equipment. We recommend to contact us in order to book it in advance. The instructors speak english and Indonesian. You can either book one or two sessions a day. The surf instructors provide you with surf boards and longboards if needed. Fishing: The waterways, bays and nearby islands offer an excellent fishing adventure and anglers will appreciate a wide variety of species. Dog Tooth Tuna, Wahoo, Giant and Bluefin Trivially, Barracuda, Spanish Mackerell and many others will provide enjoyment to novice as well as experienced anglers. Kayaking: Explore one of Indonesia’s exciting and beautiful yet endangered ecosystems and kayak your way through the mangroves. Walk: do a beautiful walk to the deserted beaches just around the corner. The purpose is to reach the tide pools where you can have a swim under a cave in the most calming environment. Inland tours: Stop at one of the various secluded hidden beaches on the way to have a swim and cool down, or explore traditional villages to catch a bit of the laid back Rotenese way of living. A high performance wave suitable for intermediate to advanced surfers at low to mid tide. At mid to high tide it can be suitable for begginers as well. Is a wave easy to paddle to as it is very close from the beach. Dana: Couple of barreling left and right hand waves that work on the right conditions. Fickle, but worthwhile. Nembrala: Very long left hand walls are the norm of the day, working from 2ft to 20ft. Nembrala is the wave Rote is known for and a great place to get the longest rides of your life. Nembrala is a wave for everybody. Oeseli: Multi section barreling left hander and a typical example of a classic indo reef. It needs a big swell to work, but a sight to behold. Do’o: Intense righthand point off the southern tip of the uninhabited Do’o Island. Transfer from and to the airport or harbour is complementary. There are two flights a day from Kupang to Rote Island and vice versa, operated by Wings Air. You can buy the domestic plane tickets trough the websites: traveloka.com or tiket.com. If you are travelling with surfboards bigger than 6,2 feet, we recommend you to book the flight operated by Wings Air. There is a policy in Kupang airport that no boards longer than 6,2 feet can be checked in the Kupang – Rote flight. If you book the Wings Air flight Denpasar – Rote, they will check your boards in Bali and you will collect them in Rote. This flight makes a 35 minute stop in Kupang, however you do not have to leave the plane. Flight departs Denpasar, Bali (DPS) at 11.25 am and arrives in Kupang (KOE) at 14.35 pm. Flight departs Kupang (KOE) at 15.10 pm and arrives in Ba’a Rote Island (RTI) at 15.40 pm. If you are travelling with no boards, or smaller boards than 6,2 feet, you also have the option of travelling with the Garuda flight. Flight departs Denpasar, Bali (DPS) at 10.55 am and arrives in Kupang (KOE) at 12.50 am. If you are taking another airline which is not the ones above, please make sure that the flight from Denpasar to Kupang arrives before 13.30 pm, to have sufficient time to connect. Flight departs at 05.00 am and arrives in Kupang (KOE) at 10.00 am. Flight departs at 08.40 am and arrives in Kupang (KOE) at 12.40 am. The afternoon flight departs Kupang (KOE) at 15.10 and arrives Ba’a, Rote Island (RTI) at 15.40 pm. Wings Air gives 10kg baggage allowance and two small pieces hand luggage. Extra weight is 14.500IDR per kg (1.10USD). Surfboards are charged 200.000IDR (16USD) per surfboard, but be aware they have size restrictions, if your board is bigger than 6,2 feet, it might be not allowed on the plane and they will send it with the ferry. Garuda does not charge for surfboards domestically as long as it is within your 20 kg luggage allowance. Flight departs Rote (RTI) at 7:30 am and arrives in Kupang (KOE) at 7.55 am. In the airport of Rote, they are not so strict with the surfboards policy. We will always try to help you checking the boards on the plane, however if by any chance you are not allowed, we can send the boards on the ferry for you and you will be able to pick them up in Kupang. We recommend you to take the afternoon flight operated by Lion Air. We suggest this flight, as we believe is the safest option. In case there would be a cancellation of the morning flight from Rote to Kupang, you would still have enough time to catch the morning ferry. We recommend you the following two flights for the same reason as mentioned above; it gives you enough time to travel with the fast ferry, in case there would be any flight cancellation. We always recommend our guests to travel with travel insurance as in Indonesia we are weather dependant. Additionally we advise our guests to leave a minimum of 24 hours time to catch their onward international flights, to have enough time to reach Bali, Jakarta or Surabaya for your onward flight.